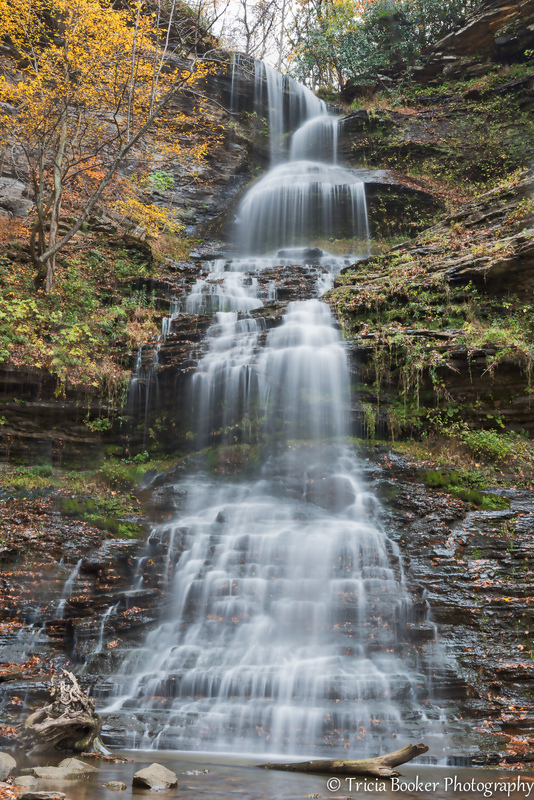 Last week I was fortunate to have nearly ideal weather for photographing Cathedral Falls in West Virginia as I drove home from Kentucky to Virginia. The steady rain wasn’t the best for long-distance driving, but it allowed me to set my camera for long exposures without having to use filters. As a bonus, there weren’t any other people admiring the falls, so I had the opportunity to get in closer than I usually do without blocking anyone’s view. I carefully carried my camera and tripod over the rocks and then tip-toed along the side until I could get some new compositions. Thankfully, I’d thought to bring an umbrella along, because the rain did start to get heavier right when I’d set everything up. The fall colors were maybe slightly past peak, but I did manage to angle myself to get some into the frame. 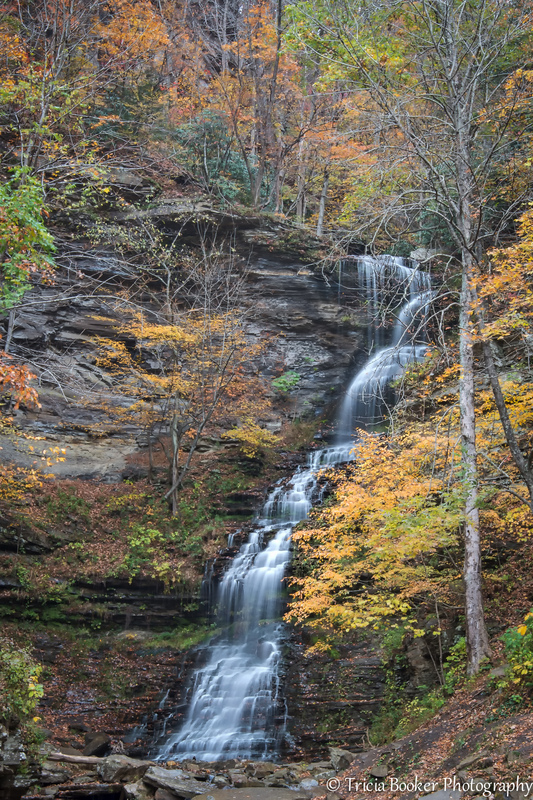 This waterfall is 60 feet tall and one of the most popular on the Midland Trail (U.S. 60), which traverses the mountains of southern West Virginia along the same path as I-64. If at all possible, I try to stop at Cathedral Falls on my trips to and from Kentucky because it’s so easy to access. You can actually see the waterfall from the road, so if the water is just trickling you can keep on driving. On this day, everything worked out quite nicely, and the shots I got were most definitely worth the effort and wet feet. What a wonderful November morning gift of your photograph! Thank you! How beautiful, both the falls and the photos! So beautiful Tricia. They would look stunning enlarged and framed.